Aquatic farmers in Andhra Pradesh face several problems. However, there is neither a good platform nor a mechanism to express concerns relating to rearing and marketing of fish. 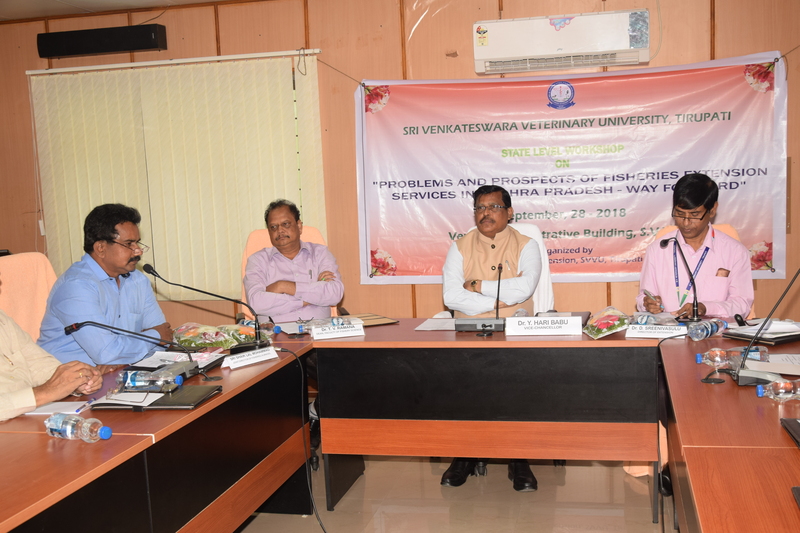 Sri Venkateswara Veterinary University, Tirupati, tried to address these issues through an interactive workshop by providing a platform for varied stakeholders in aquatic farming. 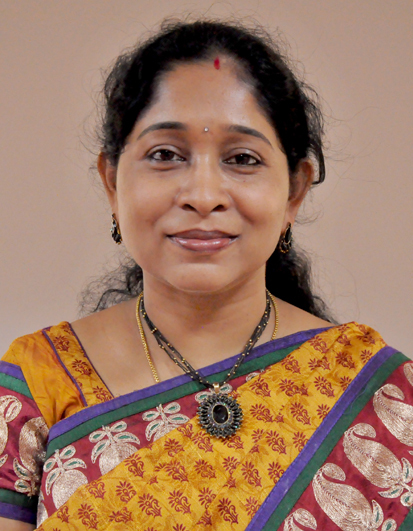 Dr D Sreenivasulu, Dr G Triveni, Dr D Srinivasa Rao and Dr TV Ramana reflect on this workshop. India is the second largest producer of fish as well as second largest producer of fresh water fish in the world. Fisheries sector in India provides food security and employment to millions of people. It contributes to about 1.07 per cent to the India’s Gross Domestic Product. India produced about 114.10 lakh tonnes of fish and exported fish and fish products worth about Rs.37,871 crores during 2016-17 (Annual Report 2017-18, Department of Animal Husbandry, Dairying and Fisheries, Ministry of Agriculture and Farmers’ Welfare, GOI.) It has a great potential in view of its vast coast line of 8,118 km in addition to fresh water resources consisting of several rivers, canals, reservoirs, ponds and tanks, lakes, brackish waters, and estuaries. In view of its importance, 21 November is celebrated as World Fisheries Day across the world through rallies, workshops, cultural programmes and exhibitions highlighting the importance of human lives, of water and the lives it sustains. Andhra Pradesh produces approximately 800,000 tonnes of Indian major carps (Rohu, Catla,Mrigal, common carp). In addition to carps, other species such aspangus, pacu and vannamei (shrimp) are contributing to the freshwater aquaculture production. Revenue of Rs. 58,000 crores is generated by the state government through aquaculture sector during 2017-18. Total area under aquaculture in the state is about 1.96 lakh ha and out of which more than 70% is under freshwater aquaculture and the rest brackish water. The per capita consumption of fish in the state is 12 kg per annum which is more than the national average of 8-9 kg for fish eating population. Fish farmers often seek technical advice from the Department of Fisheries, College of Fishery Science, SVVU; ICAR-Central Institute for Freshwater Aquaculture (ICAR-CIFA) and private consultants. However, the prawn farmers often depend up on the feed companies, hatcheries and private consultants for obtaining technical advice. Although, several institutions are working for the welfare of fish farmers in the state, none of them provide effective extension and advisory service to fish farmers. These institutions operate almost independently without any coordination and involve in different activities depending upon their respective mandates. Fish farmers depend upon private consultants to seek technical guidance and middle men for marketing their produce. State Department of Fisheries: Activities of the department are around registration and enforcement of fish farms, fish farmers group and cluster formation (common water resource), documentation and implementation of various schemes under central and state sector, selection of beneficiaries, creation of awareness about the cultural practices, rescue operations and disaster management, soil and water testing, disease diagnosis, providing technical guidance to the farmers etc. These activities are more of administrative in nature rather than technical. Although, it is the major institution responsible for delivery of extension advisory and services to the farmers in the state, the fishery development officers are not able to perform this task effectively. During the workshop, it was clear that the involvement of officers in the fishery extension activities is very low. This might be the reason for many farmers complaining about the poor visibility of the officers in the villages. The officers also agree on this issue. However, they expressed their inability due to shortage of staff and more area under their jurisdiction. They are also bogged down with the implementation of schemes and record work in view of the pressure from the Government. 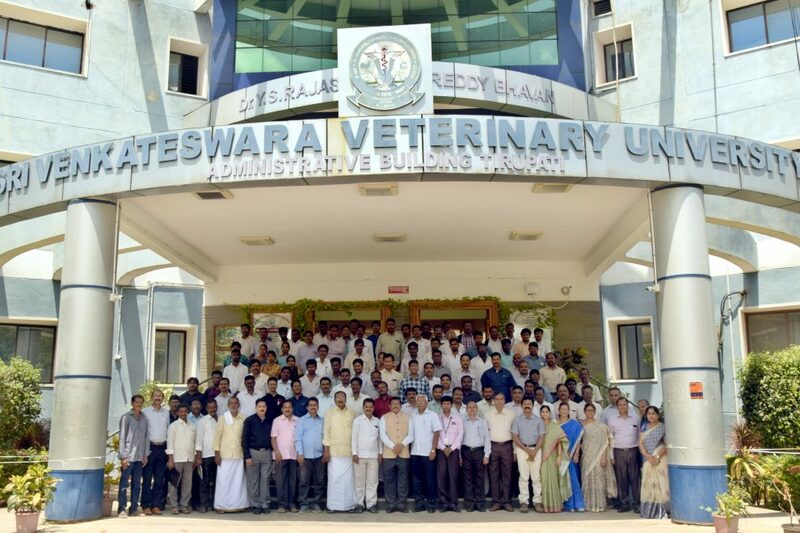 Sri Venkateswara Veterinary University (SVVU): The University has a Fishery Science College established at Muthukur (Nellore District) in 1991 which is offering a four-year degree programme (BFSc) and a two-year PG programme (MFSc). This college, first of its kind in Andhra Pradesh has excellent infrastructure with a central instrumentation laboratory required not only for training the students but also to extend technical and service support to the fish farmers. 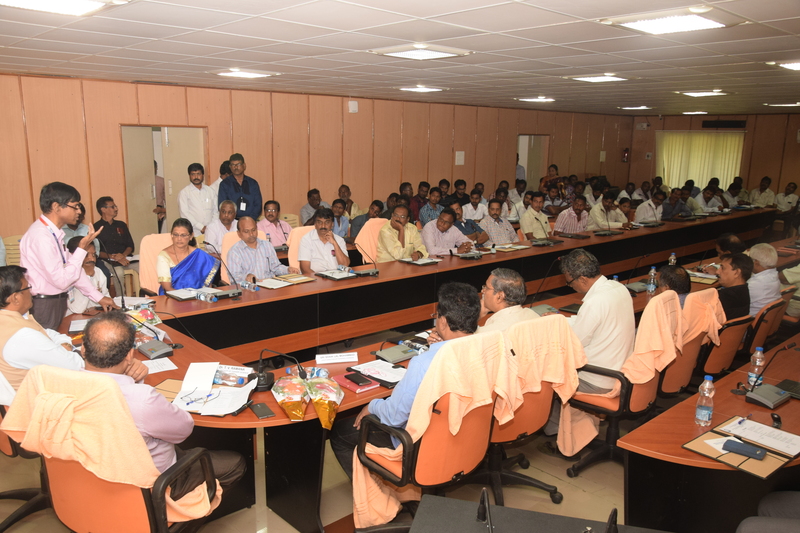 The University has also established two Fishery Research Stations at Kakinada (EGDt) and Undi (WGDt) basically to conduct research on issues pertaining to the fish production and processing. They also serve as demonstration units to the fish farmers. One Polytechnic at Bhavadevarapali is also functioning to develop field level extension functionaries. Recently, the FRS at Undi was strengthened with sophisticated equipment to assess the quality of fish and issue certificates to the fish farmers. About Rs.6 crores was spent on purchase of equipment and improving the infrastructure at Undi. All these institutions are established mainly to produce technical manpower and to provide technical guidance to the fishery staff as well as the fish farmers. The role of institutions, with limited staff and emphasis on teaching and research, in extension is very limited. Krishi Vigyan Kendras (KVK): There are 24 KVKs functioning in Andhra Pradesh. The KVK at Undi under the administrative control of Agricultural University has a subject matter specialist in Fishery Science. In most of these KVKs including the one under the administrative control of SVVU, the post of Subject Matter Specialists in Fishery Science is vacant, and hence not able to cater to the specific requirements of the fish farmers in the state. Fish Hatcheries and Feed mills: There are 28 commercial feed mills in the state to supply feed (both floating and sinking) to the fish farms and 80% of these mills are located in West Godavari and Krishna districts. Similarly, there are 39 hatcheries both in public and private sectors to meet the demand of the carp seed. These institutions through their technical consultants also provide technical know-how and extension advisory to their respective customers. 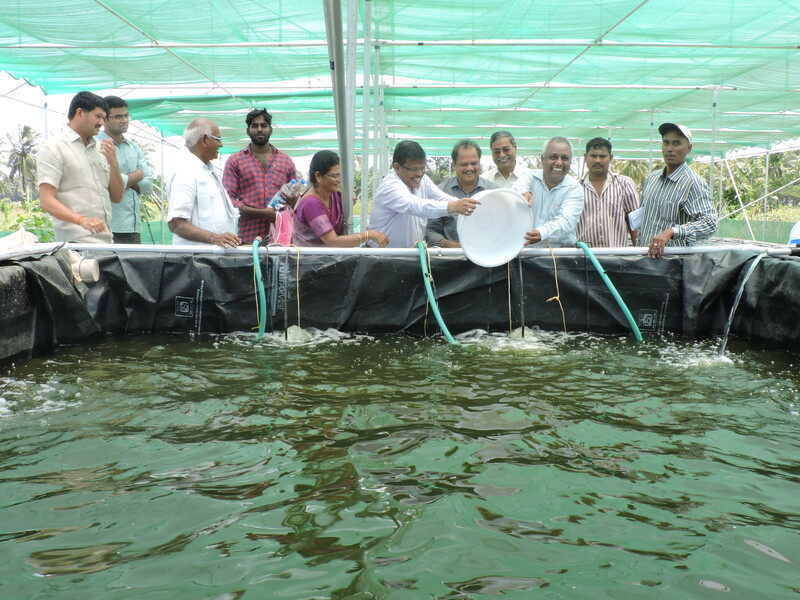 ICAR-Central Institute for Freshwater Aquaculture (ICAR-CIFA): A regional centre of ICAR-CIFA is functioning at Vijayawada. 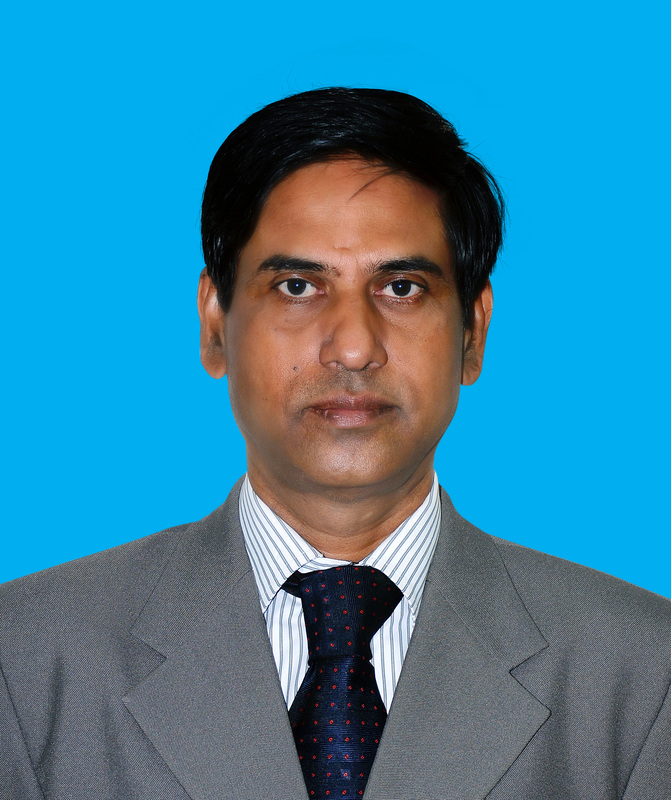 In addition to conducting research on various aspects of freshwater aquaculture, it is also involved in demonstrating diversification of alternate species and innovative technologies and to popularize technology transfer through on farm training and to provide extension and technical services to the fish farmers. Through demonstrations it is propagating Jayanti Rohu, cage fish farming for rearing fish seed in reservoirs, use of bio fertilizers and bacterial fertilizers for enhancement of aqua production. It also organises training programmes for fisher women, Self-help group members in postharvest technologies of making fish products. 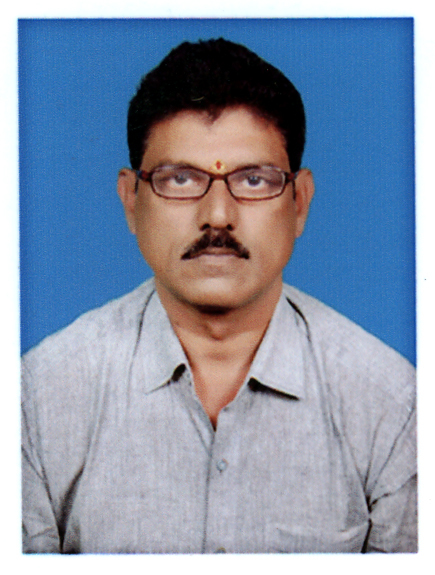 It also coordinates the visits of fish farmers of different states to study the aqua culture in Kolleru region. With limited staff (three scientists and one technician) one can imagine its reach in providing technical guidance and services to the farming community. National Fishery Development Board (NFDB): NFDB under the Department of Animal Husbandry, Dairying and Fisheries, Ministry of Agriculture and Farmers Welfare, Government of India is the apex body that is committed to the welfare of fish farmers in the country. Its activities include intensive aqua culture in ponds and tanks, fishery development in reservoirs, coastal aqua culture, infrastructure development in terms of fishing harbours and landing centres, technology upgradation, domestic marketing etc. It is involved in developing a national policy on marine culture, promoting aqua one centre ICT enabled support service. In addition, it brings out bi-monthly NFDB e-bulletin and package of practices (i.e., publication) for the benefit of fish farmers. (http://nfdb.gov.in/activities.htm). 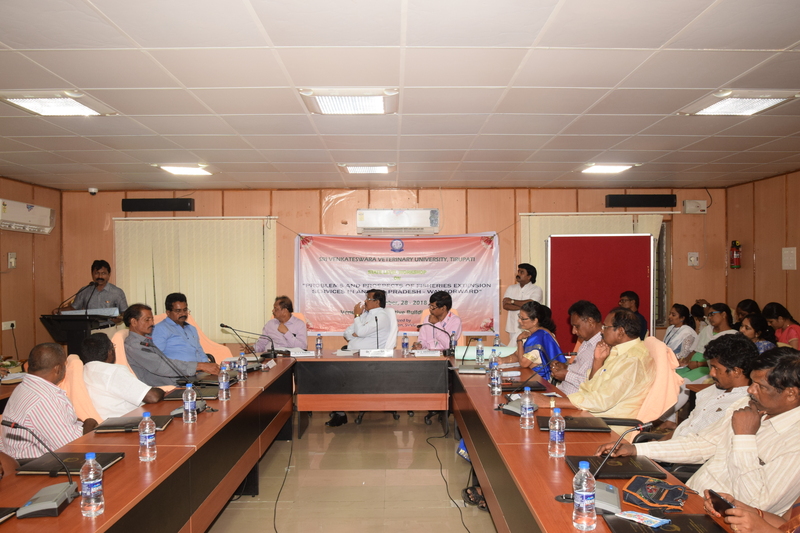 A one-day workshop was organised by the Directorate of Extension, SVVU, Tirupati, on 28 September 2018, by inviting fish farmers and officials of the Department of Fisheries from all the 13 districts of Andhra Pradesh. 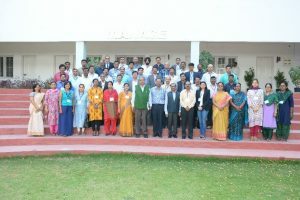 The participants of the workshop representing the state department were Joint Director (JD), Deputy Directors (DDs), Assistant Directors (ADs) of Fishery Department; Faculty of Fishery Science of the SVVU, fish farmers from different districts of Andhra Pradesh, Central Institute of Freshwater Aquaculture (ICAR-CIFA) and National Fishery Development Board (NFDB). Way forward to help in the welfare of the fishfarmers. The SVVU has provided a very good platform for fish farmers to express their problems in fish production, processing and marketing. As explained earlier, fish farmers were divided into two groups and there is wide variation among these groups in their perceptions on problems experienced. The list of constraints presented by the group leader based on the consensus arrived at after discussion among the participants is presented in Box 2. Many farmers in this group pointed out that they were not aware of the Fishery Development Officer working in their respective areas. The farmers opined that the government is getting good income (taxes) through fish marketing and it must spend at least a little of it on the establishment of good quality control labs to test and evaluate feeds and medicines. Similarly, the government must focus on proper use of fresh water and disposal of drainage water. 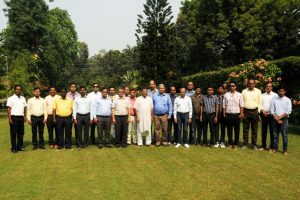 They also suggested that the SVVU may come out with appropriate use of communication channels to provide reliable and timely information to the farmers on prevention and control of diseases which help them to reduce losses. They also aired concern over the indiscriminate use of antibiotics on which they have no control, as the antibiotics are mixed in the feeds in the mills. Lack of cold store facilities was also considered as another important constraint coming in the way of fish production and marketing. The farmers of Rayalaseema and north Coastal Andhra raised many constraints and the important ones are given in Box 3. 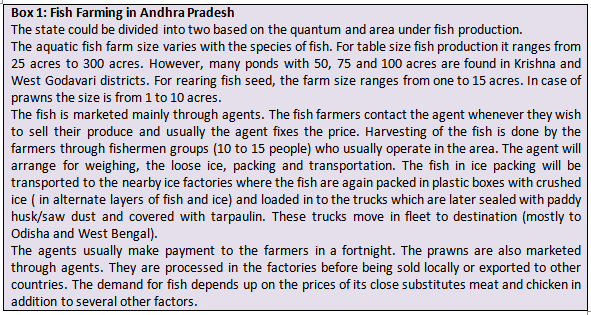 The farmers of this group specifically requested the government to relax the specifications, rules and regulations that are in vogue in Coastal districts as the districts of Rayalaseema and north coastal Andhra are comparatively backward in fish production. The government policy should be specific to region depending upon the situation rather than for the entire Andhra Pradesh. There was a brief presentation by an entrepreneur, Sri Murali Krishna from Ananthapur and it motivated the young fish farmers to seek his advice. His tips for successful fish farming are as presented in Box 4. Sri Janardhan Gangaputra, Governing Body member, NFDB in his brief address presented the activities of NFDB and gave many suggestions for fish farmers. He expressed his displeasure over the greediness of some of the fish entrepreneurs indulging in malpractices and bringing bad name to the State which must be overcome. Due to excessive antibiotic usage in feeds (antibiotic residues), fish exported to USA and Europe came back to India. Feed mills and hatcheries are the main culprits in this process. He also highlighted the scope for fishery diversification by bringing in new and more species into farming. He suggested the need for promoting fish food consumption in place of broiler chicken as the latter contains more of growth promoters and antibiotic residues. He also highlighted the blue revolution scheme to improve the economic condition of the small-scale fish farmers. The Department of Fisheries may take lead in taking further the initiative provided by the SVVU through this workshop in coordinating with the latter in developing suitable training modules to enhance the capacity of their officials. To begin with, training modules may be developed in the consensus areas which include i) disease diagnosis and treatment ii) latest culture practices and best management practices in aquaculture. The department staff as well as the farmers must be kept informed about the latest developments on fish farming. The SVVU, being an academic institution possessing latest information on fish farming may develop a viable communication network with all the stakeholders of fish farming to provide them timely information through print and electronic media. The main problem the farmers are facing is the improper use of water and disposal of drainage water. It is good that the Department is coming out with a comprehensive law to protect the interests of the farmers. The leasing of land, construction of pond, proper use of water and disposal of drainage, market interventions etc hopefully are covered under this law. 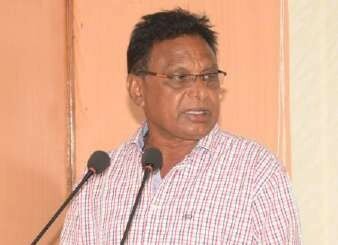 The SVVU may provide technical guidance in establishing laboratories in all the mandals accessible to the farmers in analysing soil, water and feeds. For further detailed analysis, the samples may be analysed at the referral labs established by the SVVU at Nellore and Undi. The Govt. of Andhra Pradesh may fill up the vacant positions in the Department of Fisheries to enable them to focus on field extension activities and help the farmers in solving their problems. Unless the staff position is increased it appears well nigh impossible for the staff to organise field visits and increase the frequency of contact with the fishfarmers. The Research organisations (SVVU, CIFA etc) must develop disease resistant varieties of fish, measures to control antibiotic residues in the fish, methods to prevent and control of emergingdiseases. The Government may come out with measures to check the exploitation of the farmers by the middlemen, exercise control over the input prices and help the farmers to get remunerative price for theirproduce. In view of the increasing problems of antibiotic residues and heavy metals in the fish produced in the state, the government must check indiscriminate use of antibiotics by the feed mill manufacturers and hatchery units in the state. It may constitute a quality control committee consisting of experts from all the important stakeholders to check these units and suggest measures to mitigate the problem of antibiotic residues infish. It may be worth toying with the idea of backyard fish production similar to the pond culture in West Bengal and Orissa to enhance the production and consumption of fish among the resource poor people. This helps in improving the nutritional status of thepeople. It is imperative that all the stakeholders must work in cohesion with a unified goal of fish farmers’ welfare. This workshop has laid the foundation for developing a sustainable and viable stakeholder platform in the service of fish farmers. Acknowledgement: The authors are grateful to Dr Y Hari Babu, Hon’ble Vice-Chancellor, SVVU, Tirupati for extending full support and guidance in organising this workshop. 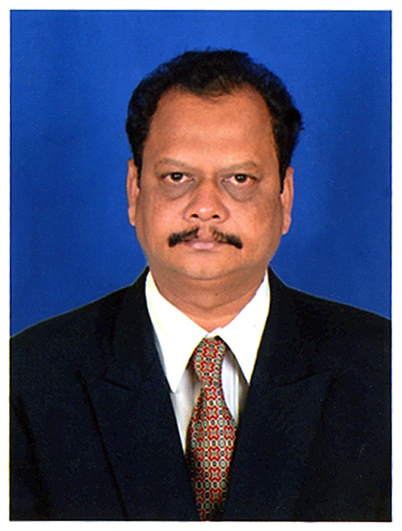 They are also thankful to Dr SVN Rao, Professor of Extension(Retd. 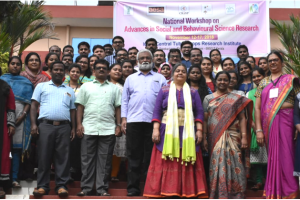 ),Pondicherry; Dr PV Rangacharyulu, Principal Scientist, ICAR-CIFA; Dr D Thammiraju, Principal Scientist, ICAR-NAARM for facilitating theworkshop.